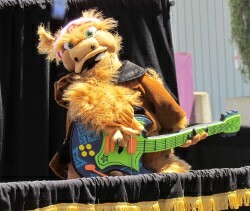 Touchstone Tales Theater provides smiles free of charge! 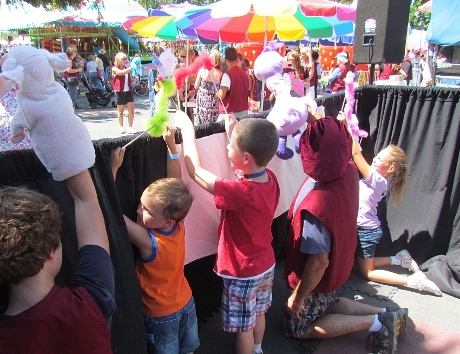 Through classic fairy tales and original works, our puppet shows expose children to literature and performing arts while delighting and engaging them and gently reinforcing the moral of the story. Our performances — in parks, libraries, hospitals, schools and other places children gather — feature a colorful, magical theater, talented puppeteers, sing-along musicians and a hands-on craft time. Every Touchstone Tales Theater performance is accompanied by fully interactive craft tables. Children have a hands-on experience as they create their own puppets or storybooks, cognitively reinforcing the elements of literature, such as theme, plot, setting and characters. They also get to express their creativity, each youngster giving his or her work of art its own personality. Touchstone Tales Theater performances are tailored to each venue and occasion and can include fun and energetic sing-alongs. Our musicians have extensive experience with children and a full repertoire of engaging songs, complete with wacky hand motions. 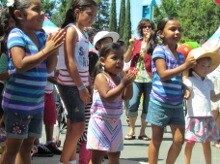 Children (and adults) are encouraged to jump up and down, spin around and sing at the top of their lungs. In the words of one of our sing-along songs, our fee is, “Nothing, nothing, absolutely nothing!” We see Touchstone Tales Theater as an opportunity to use the gifts God has given us to enrich our community. We live here, raise our children here and know how valuable it is to have access to educational entertainment. Sure, there may be no free lunch in this world, but God offers us heaven as a free gift, and we simply want to follow His example. Touchstone Tales Theater is an outreach of Touchstone Christian Fellowship. Our performances are generally non-religious. We believe the church should be a presence in our community and that instilling in children an appreciation for the arts will improve their lives and improve our community. If a group requests a Biblically-themed event, we can provide that, but Touchstone Tales Theater exists primarily to serve the whole community, providing a service many public institutions are no longer able to. If you would like Touchstone Tales Theater to perform for your organization or event, please contact us via email at: tales@touchstonecf.org or call the church office.